There is a very good reason why some things are partnered together again and again – quite simply, they work. Vodka and tonic, the little black dress and high heels…..chicken and avocado. So little goes into this salad, yet the flavours are incredible; they marry together so well. The creaminess of the avocado and roasted chicken, the sea salt which the avocado really needs, the lemon and olive oil bringing everything together on the background of salad leaves. It’s quite amazing how something so simple can be so spectacular. 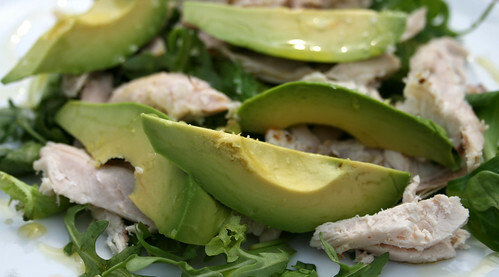 Scatter chunks or slices of roast chicken on a bed of salad leaves. Halve an avocado, remove the stone and cut each half into three before removing the skin with a knife. Add the avocado slices to the salad. Drizzle over some freshly squeezed lemon juice and extra virgin olive oil then finally sprinkle over some sea salt.